This looks really awesome, Skype is preparing for a big surprise for iPhone and iPod touch users, according to Engadet, it appears that a new update is coming to Skype which allows the iPhone and iPod touch users to make a video chat with all Skype users even they were using a Skype desktop version. During a video call tap your screen to display the camera and microphone controls. Tap and hold down the microphone button to put the call on hold. To resume the call, simply tap thehold symbol on the screen. Yes, at any time during a Skype video call you can choose to turn off the video. Tap theCamera button and select the No Cameraoption. To turn the video back on tap theCamera button again and then tap the camera you want to switch on. When your iPhone is processing a lot of video its CPU (Central Processing Unit) has to work very hard and makes the iPhone become warm to the touch. You will experience the same thing if you stream videos through applications like Netflix or YouTube. Yes, you will be able to receive screen shares from people using Skype for Windows or Mac OSX. You cannot share what is on the screen of your iPhone with other people and you cannot receive a screen share from another iPhone user. 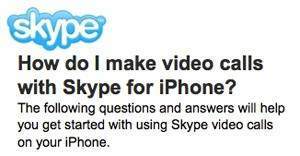 No, you will be switched to audio only, as Skype for iPhone does not support group video calling. The quality of the video you send and receive from your iPhone will depend upon the quality and bandwidth available on the WiFi or 3G network you are connected to. For best results, make sure you have nothing else running that might use up your bandwidth.